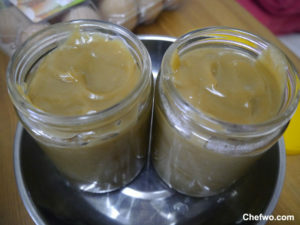 Nyonya kaya recipe or nyonya coconut and egg jam. Why Nyonya?, I think it’s Melaka style of making coconut jam using gula melaka or palm sugar. This is my own nyonya kaya using ingredients i know will taste superb. I prefer gula melaka version, what about you? ** Do not buy store bought, it’s too diluted with water. Before you start to make kaya, make sure utensil is dry from water. Go to the loo and have your lunch first, because you can’t stop halfway not even picking up the phone! Keep on stirring until you almost dries up, depending how dry you want. Mine turn clumpy, so here’s the tips, blend to get smooth kaya. Wait till your kaya it’s not hot anymore. Then pour kaya into container. Keep inside fridge and consume within 2 weeks. Tips: Best to eat with crackers, toast bread with butter, any pastry bread.